Retired Lt. Col. Robert Friend (circled) pictured as a young captain serving the 332nd Fight Group. 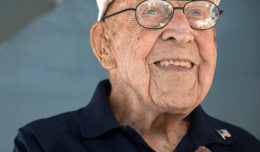 Friend, one of the last surviving Tuskegee Airmen who served during World War II, spoke to groups of high school students in southern California earlier this month. 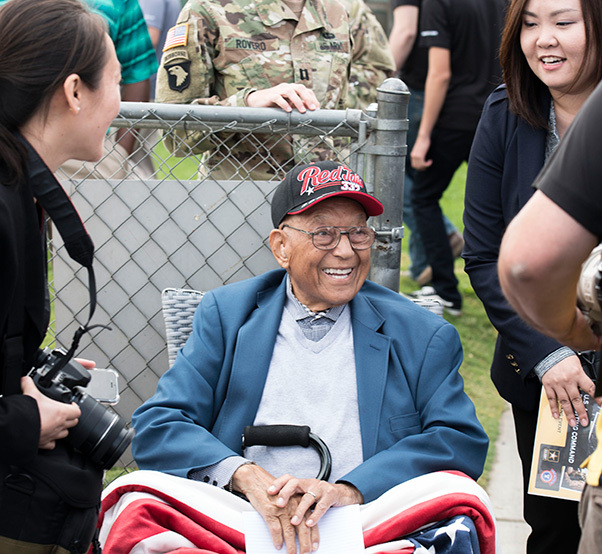 Sporting a crimson “Red Tails” ball cap, 97-year-old Robert Friend delivered a powerful message to a diverse audience of students, JROTC cadets and teachers at Vista High School in Vista, Calif. 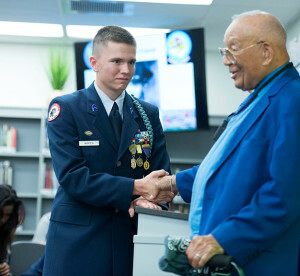 Earlier this month, as part of Army Recruiting Command’s outreach program, Friend visited with high school students here to share stories of and dispel misconceptions about the wartime experiences of Tuskegee Airmen. 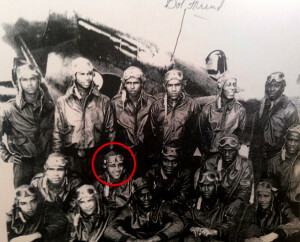 “Anybody that was not white had to be trained at Tuskegee,” Friend said. 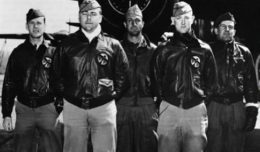 Having already earned a civilian pilot’s license while in college, and after receiving appropriate training from the military, the Army assigned Friend to the 301st Fighter Squadron, part of the 332nd Fighter Group. Staff Sgt. Kimberly Smith, a recruiter with the San Marcos Recruiting Company, said Friend’s presentation resonated with her, particularly considering the community where she performs recruiting duties for the Army. Chris Morden, a JROTC student at Vista High School (Calif.) presents his school’s JROTC patch and t-shirt to retired Lt. Col. Robert Friend. Friend, one of the last surviving Tuskegree Airmen, spoke to students at Vista and Fallbrook Union High Schools in southern California, Nov. 2, 2017. “Looking at my school, the majority of us are minorities, so it definitely had an impact in that sort of way,” said VHS senior Jacob Hernandez, a JROTC cadet. “I know a lot of minorities feel un-included, and Lt. Col. Friend contradicts that. Maj. Gen. Jeffrey Snow, commander of U. S. Army Recruiting Command, said Army recruiters can help meet the Army’s end strength goals by continually pushing for diversity. An Army that reflects the growing diversity of the nation, he said, is also a stronger Army. Retired Lt. Col. Robert Friend jokes with international media members during Army Recruiting Command’s outreach event Nov. 1, 2017, in Perris, Calif. Friend attended to officially swear in about three dozen new Army recruits. 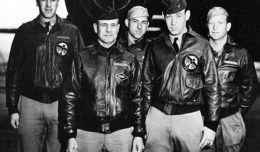 Friend said that today’s military has made significant leaps towards inclusion since the armed services implemented racial integration. Hernandez, for instance, said he plans to enlist in the Army, attend college, and eventually commission as an officer. He said Friend’s presentation helped reaffirm that decision. “I definitely know that enlisting is going to help me out as far as setting up my future,” Hernandez said.